Sega: MadWorld and Wii Were a "Mismatch"
In yet another sign that Sega has settled on its decision to give up mature game development for the Wii, Sega West President Mike Hayes said the commercial failure of MadWorld was due to a "mismatch" with Nintendo gamers. 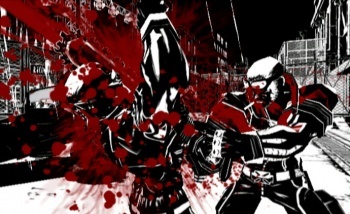 Sega rolled the dice a couple of times with M-rated games for the Wii last year, with the sci-fi FPS The Conduit and the stylish, violent brawler MadWorld, neither of which caught on very well with gamers. MadWorld received considerable critical acclaim but only managed to sell around 66,000 copies in its first month of release, a big part of why Sega said earlier this year that it was "probably" done with making mature games for the Nintendo platform. In a recent interview with CVG, Sega West President Mike Hayes made it clear that strategy isn't going to change anytime soon. He said the "natural home" for Platinum Games, the Japanese studio behind MadWorld and the far more popular Bayonetta, is on the Xbox 360 and PlayStation 3, because those are the platforms of choice for the vast majority of mature gamers. "Critically [MadWorld] got a lot of acclaim, but commercially it wasn't the success we wanted it to be. Clearly that was a mismatch with the Wii audience - particularly in terms of the amount of cross-ownership between Wii and the other home platforms. If you're going to play a mature-rated game, you're going to get your 360, PC or PS3 out to do so," he said. "We were brave in that area - but the reality is, Platinum Games is such a cutting-edge developer they need the PS3 or 360 to realize what they actually want to do," he continued. "You saw that with Bayonetta - it was a very high-quality standard... Platinum are definitely more at home on those platforms." Platinum Games is currently working on Vanquish, a third-person shooter person shooter for the Xbox 360 and PlayStation 3 due out in late 2010.